"Like" token, awarded by RandomDSdevel. "Like" token, awarded by CKoerner_WMF. 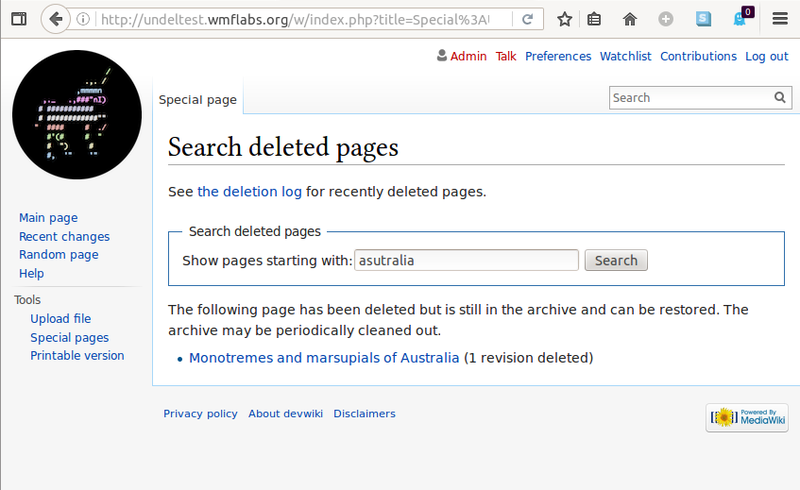 This is an instruction page for "undelete archiving" functionality, deployed at http://undeltest.wmflabs.org/. It implements the functionality of indexing deleted pages via ElasticSearch (CirrusSearch extension). This complements indexing usually available for existing pages, so you can now search for partial and unexact matches for the name of the deleted page in Special:Undelete page. Note: You may need to fill a captcha when editing - use word "mellon" for it. Create a new page, for example "Mac and Cheese" - be creative and invent your own name though, if everybody uses the same title it would not give diverse feedback. Login as Admin with the password described here: MediaWiki-Vagrant docs at number 7. Delete the page you created in (2). Go to http://undeltest.wmflabs.org/wiki/Special:Undelete and search for "'''chease'''" (note partial and inexact match) - again, be creative with your own title but not ''too creative'' - the name should be still close to what you are looking for to be found. Observe that the page deleted in (2) is in the list. What unholy magic is this? You are welcome to review/comment. As an administrator, I want to search the archive table for deleted pages whose title I don't exactly remember, or are similar in nature -- e.g. "Dr. John Smith", "John Anthony Smith" and "John Smith". Discussion on en.wp's admin noticeboard. GSoC '16 and Outreachy-12 have started. The scope of the project is not very detailed. Can it be pushed for the current rounds of GSoC/Outreachy and is anyone willing to mentor this project? Ideally the project should not take more than 2-3 weeks for a senior developer to complete. @Sumit : I will be interested in participating on this project as an intern for the GSoC '16. How can I ping potential mentors on this task? @Billghost: I'd recommend you ask this (and any other technical) question on irc://irc.freenode.net#wikimedia-dev (preferred) or https://lists.wikimedia.org/mailman/listinfo/wikitech-l .
Hello I am working on implementing the fallback case mentioned in (T109561#1940512). I've gone through https://www.mediawiki.org/wiki/Manual:Database_access and don't see any related documentation on writing full text queries with the databae abstraction layer. Any pointers will be welcome. Hello! I would like to work on this project for this upcoming round of GSoC 2016. Is anyone willing to mentor? Billghost raised the priority of this task from Normal to Needs Triage. Using MATCH AGAINST is indeed probably the direction this would go, although we may want a separate archiveindex table instead of making archive a full-text-search table. (With some sort of hook for extensions to override if they want to do something lucene-y instead of mysql fts). Im unclear on why you have GROUP BY and the COUNT(*). There's also an sql injection in this code if $prefix contains an apostaphe (use $dbr->addQuotes( $prefix) instead of $prefix directly). What is the status of this task after the Hackathon? I have tried to summarize the progress on this task at https://meta.wikimedia.org/wiki/Wikimedia_Blog/Drafts/WIP_Wikimedia_Hackathon_2016_post#The_connection_with_the_Community_Wishlist. Is there any beautiful screenshot in Commons that we can reuse? Any place to test what was demoed in Jerusalem? Looking at the patch, this looks like it's awaiting some code review and discussion about the implementation. Pretty routine stuff, but since this isn't within our team's goals that'll happen whenever we have a little downtime. That I can't answer. Perhaps @Smalyshev might have a screenshot from his dev instance? No screenshots unfortunately. We had a demo server but I think I shut it down. I'll check and restore it if it's down. It seems to work really well, at finding both matches within the title, and mis-spelled words. @MER-C and anyone else who has experienced frustration with the missing feature, please could you give this a try, and add your feedback here? I've posted on the Administrators' noticeboard. The description of the text field ("show pages starting with") is now incorrect. This feature and the old prefix index search should co-exist, like [[Special:Prefixindex]] and [[Special:Search]] do for live pages. It would be useful to have an API, but this is something that we can live without for now. Filtering by namespace is required (see below). 13/15 pages found -- behaving as expected, but "AlexBugatti" should have been found by the first search and "Печкуроў - Pechkurov " by the last. I can see how this could occasionally be pretty useful. I just tried it out for a couple of minutes, just one article in article space. Seemed to handle a reasonable number of typos; 1 (occasionally 2) typos per word, even when each word had a typo in a four word title. Seemed to handle only being given a very small portion of the article title well. I note that it handles typos like "herw" instead of "here" easily, but can't handle homonyms like "hear" instead of "here". Not complaining, as I have no idea how you'd go about doing that, but you wanted feedback so here's some feedback. But overall, yay. Regarding the progress on this, could this task use help from an Outreachy intern( Dec 6 to March 6 )? Please note that applications are open until Oct - 17. Let us know if possible at the earliest. Ideally it should take about 2-3 weeks for an experienced developer to complete the task, in order to qualify as an intern project. @Smalyshev and @EBernhardson would you be interested in continuing to work on this? I'm wondering what might help to get this done. And, our outreach programs GSOC/Outreachy are coming up as well! We're still in the same point unfortunately - "almost there". I wonder if we need to really put it on schedule to get it done, because otherwise it just keeps being postponed. @Deskana, what do you think? This task isn't really within our current objectives or goals. However, the benefit to advanced users is clear, and since we're almost there, I think it makes sense to prioritise it and do that little bit more to get it in to production. Deskana moved this task from needs triage to Current work on the Discovery-Search board. Deskana edited projects, added Discovery-Search (Current work); removed Discovery-Search. Deskana raised the priority of this task from Low to Normal. Notes from some brief discussion on this by @EBernhardson and @Smalyshev: Erik thinks that index management is the primary issue outstanding here. There's a single index for all wikis, so it's not exactly clear when it should be created. We may want to turn it in to one index per wiki, but that may cause some timeout issues... but that's the standard operating procedure, so that may be the best idea. Or maybe a special script? Smalyshev moved this task from Needs review to not in use - please delete on the Discovery-Search (Current work) board. Smalyshev created subtask T162302: Add archive index to wikis. Smalyshev moved this task from Needs review to Done on the Discovery-Search (Current work) board. Smalyshev added a subtask: T163235: Archive search deployment plan. Code is in production but not yet enabled, fixing related bugs first.